Le Carrousel de Vidy is located in Lausanne, on the northern shore of Lake Geneva at Port de Vidy. This restaurant-pizzeria offers delicious cuisine inspired by the Mediterranean. Our menu offers a wide range of entrées, wood-fired pizzas , and pastas as well as meat and fish dishes. New specials are added each season. All dishes can be ordered to eat in or to take away. NWe’ve been open since 1st July 1999 in a wonderful setting. You can enjoy a wide shaded terrace, at the water’s edge, 5 metres from Port de Vidy, with views of the Alps. 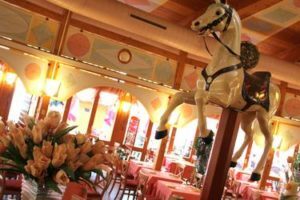 The unique restaurant is circular and features old-fashioned wooden merry-go-round horses. The well-lit interior is the perfect place to enjoy a meal. We extend you a warm welcome and an efficient and professional service for meals and dinners. In one area of the terrace, you can enjoy the open-air Bar au Lac with a lounge bar atmosphere for summer evenings at the water’s edge. 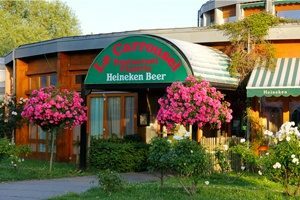 Contact Le Carrousel de Vidy, your restaurant-pizzeria in Lausanne for your bookings and quotations !